I saw a couple of harems during the trip to Istanbul. One was at Topkapı Palace, another at Dolmabahçe Palace (the latter being where all residents of the former were moved when the Dolmabahçe was completed in 1856). Prior to that time, sultans and their harems maintained primary residence at Topkapı. To most of us the term “harem” evokes images of dancing semi-clad ladies and and girls, inevitably falling into the 15th-century era-appropriate equivalent of pillow fights. Possibly even something more akin to a brothel. In reality, the far less romantic and less seductive reality is that palace harems were the wome n’s quarters where girls were raised and educated (with eunuchs as servants) to be wives and concubines of sultans and served simply as a place to live when nothing special was going on at the palace. 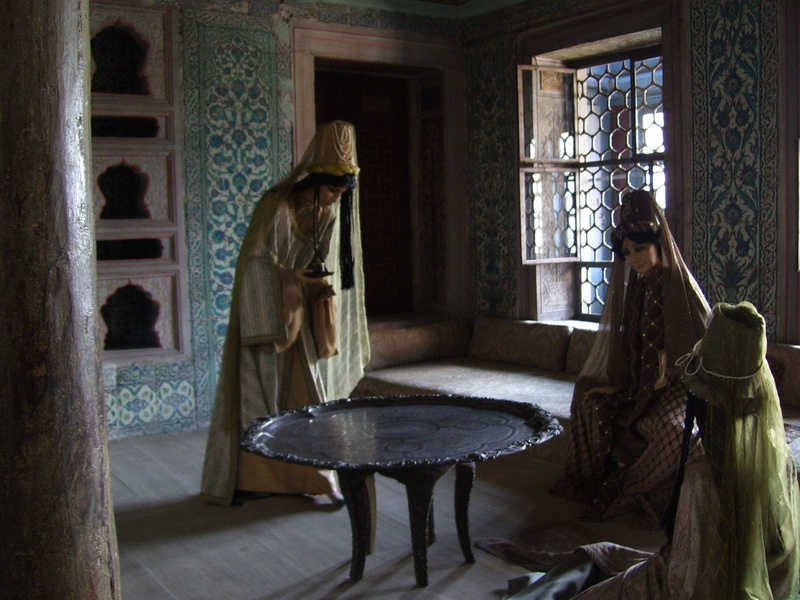 One of the areas in the Topkapı Palace harem included a rather sparse exhibit, with life-sized mannequins dressed in the period of the day. Leaves one relatively unsatisfied. What’s the untold harem story? This entry was posted in Eastern Europe, Istanbul, September 2010. Bookmark the permalink.